It is tough to explain how the Internet of Things or IoT will impact on the way we design with light and how it may change the role of the lighting designer. However, one thing is for sure, there are many new and wonderful features and services that can now be incorporated into lighting. Time has come to welcome the Lighting Design of Things or LDoT. As the industry transits from being solely focussed on architectural lighting design to incorporating the smart features of the IoT, here we discuss how LDoT will transform the lighting space. One of the definitions of a successful lighting design is that the illuminated space, in addition to being both appealing and functional, should meet the needs of its intended occupants without causing discomfort. What does that look like in today’s world where the human response maybe prompted by the data collected through smart IoT features integrated into the lighting? Moreover, how the lighting (IoT) collects data? 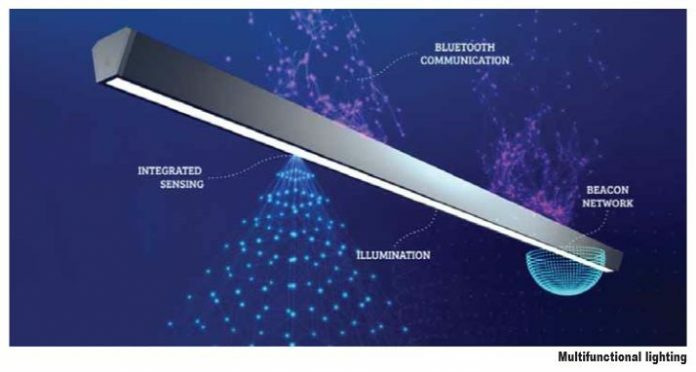 To answer the question on why lighting is the right platform for sensor applications, Bluetooth communication, beacon networking and data analytics, we need to take a look around us. Let’s say you wanted to roll out a dense network of thousands of wireless smart nodes in places such as an office building, a hospital or an airport. The cost of installing such hardware to a power supply would be exorbitant. Considering that lights are everywhere and already powered, it is easy to understand why lighting today is being treated as a primary host for mesh-connected data infrastructures. 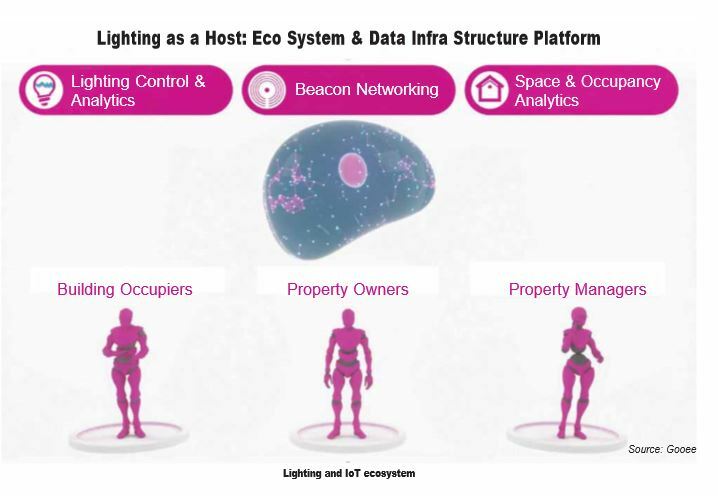 Intelligent lighting control, predictive management, space and occupancy analytics, beacon networking and asset tracking, amongst others, are popping up as IoT driven applications that lighting designers know very little about. It has been observed that so called ‘smart consultants’ are being given the preference over lighting designers to design the IoT infrastructure including the lighting. It is obviously detrimental to lighting design if IoT specialists with no real knowledge of proper lighting design, start to dictate where lighting points should go and, in the process, compromise the potential integrity of the lighting design and compliance to lighting standards. This reveals that there is a big divide and disconnect between lighting designers and the smart IoT world. To resolve this problem, global lighting design firm Klaasen Lighting Design (KLD) has created a LDoT (Lighting Design of Things) platform which puts the lighting designer right back at the centre of lighting design by taking on the role of facilitator and integrator of IoT features and functions within the lighting design process. This move is being considered as the birth of a new breed of lighting consultant — the Lighting Designer of Things. KLD’s new LDoT platform enables to connect leading IoT players with developers, property owners, operators, data system providers and other key project designers. Market research indicates that around 20 billion ‘Things’ will be connected to the Internet by 2020. These ‘Things’ will turn enterprises into digital businesses and facilitate new business models by making them more efficient and increase both employee and customer engagement. It will be up to lighting designers to fill the IoT leadership void and lead these initiatives as they relate to lighting. With lights that can see, sense and communicate with their internal and external environment, the connecting (and data collection) of assets, processes, personnel and events can be facilitated. 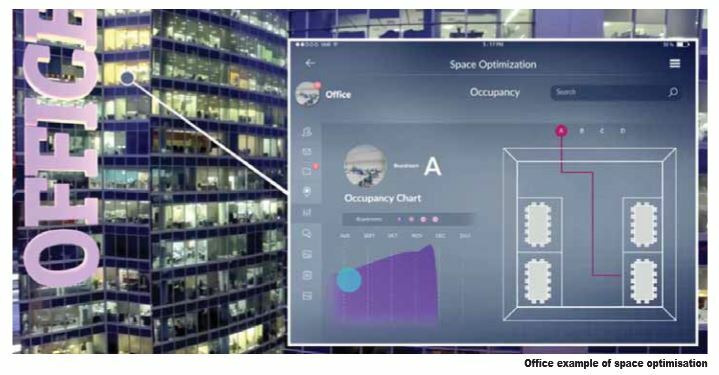 From this data a company can learn how spaces are used and better understand behavioural patterns of their occupants. A company can then react with preventative action or alter business processes. The lighting-integrated IoT forms the foundation for this capability. LDoT makes sure that the technologies are seamlessly integrated within the lighting design the same way the lighting is seamlessly integrated within the architecture. In order to create value wherever possible we have to consider cost, performance, flexibility, interoperability, compatibility, privacy, security and what generally fits best within the architecture. IoT features come in all forms, shapes and in a multitude of configurations delivering different performances. This is why we need to educate ourselves on what’s out there, what the various IoT systems can deliver and what particular companies are specialised in. Can the sensor be integrated in the light fitting we want? Is it scalable? Does it work with BMS? And so on. It becomes important to know how these components can be integrated in order to determine what can be offered to a client.